The PM said the public "expect us to reach across this House to find a way through this". Mr Corbyn said he welcomed the PM's "willingness to compromise to resolve the Brexit deadlock". 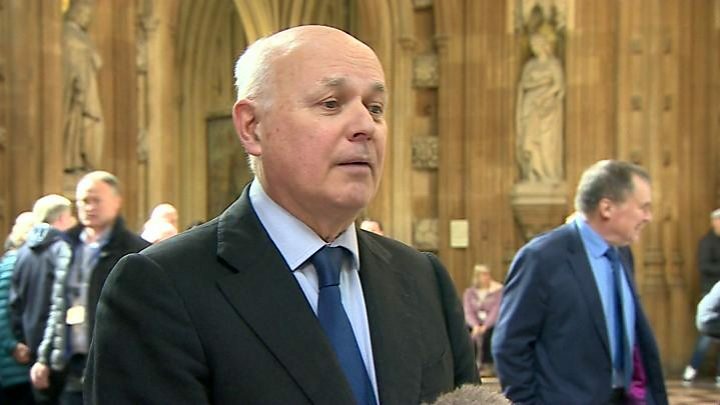 The PM's move to hold talks has angered some Brexiteers, with two ministers resigning over it. Chris Heaton-Harris became the latest to quit on Wednesday afternoon, claiming his job at the Department for Exiting the European Union had become "irrelevant" if the government is not prepared to leave without a deal. Wales Minister Nigel Adams also resigned his role on Wednesday morning, saying the government was at risk of failing to deliver "the Brexit people voted for". The PM met Mr Corbyn before holding talks with Scotland's First Minister Nicola Sturgeon and Welsh First Minister Mark Drakeford. Ms Sturgeon - who also met Mr Corbyn earlier - said she had "good" and "open" conversations with both leaders, and while she believed Mr Corbyn would "drive a hard bargain", she was "still not entirely clear" where the prime minister was willing to compromise. Plaid Cymru's Westminster leader, Liz Saville-Roberts, said: "People have the opportunity to have another shot at it, [in the Commons], to change their mind. "Surely if that is how democracy works here, then democracy should go back to the people and people should have their say on whatever model comes forward." In a statement on Tuesday night, the PM announced she wanted to meet Mr Corbyn to agree a way forward and put the plan to a vote in the Commons before 10 April - when the EU will hold an emergency summit on Brexit. She insisted her withdrawal agreement - which was voted down last week - would remain part of the deal. Brexiteers were quick to express their anger at the prime minister's move. 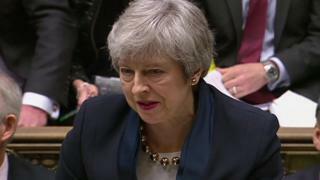 But at Prime Minister's Questions, Mrs May said she wanted to deliver Brexit "in an orderly way" and, to do that, "we have to get an agreement through the House". And Brexit Secretary Stephen Barclay blamed hard Brexiteers in the pro-Leave European Research Group for making the PM move to these talks. Mrs May told MPs there were a "number of areas" where she agreed with Mr Corbyn in relation to Brexit, including ending free movement. The Irish Taoiseach Leo Varadkar said the talks were "timely", and he hoped Mr Corbyn would "rise to the occasion" and "come up with a compromise plan" with the prime minister. The PM's negotiated plan includes two sections - the withdrawal agreement and the political declaration. The withdrawal agreement sets out how the UK would leave the EU, including the money the UK must pay to the EU as a settlement, details of the transition period, and citizens' rights - as well as the controversial Irish backstop that aims to avoid a hard border on the island of Ireland. Mrs May said on Tuesday that any plan she agreed with Mr Corbyn "would have to agree the current withdrawal agreement", but she was ready to discuss the future relationship, i.e. the political declaration. The BBC's Laura Kuenssberg said there was not much difference between the government's version of Brexit and Labour's version - but there did not seem to be "an enormous amount of confidence" a political consensus could be reached from either party. Laura Kuenssberg said there was "rage and dispute" in the cabinet meeting, with "wildly varying accounts" of how many people were for and against different versions of Brexit extensions. Labour has previously said it has five demand for supporting a Brexit deal, including protecting workers' rights and national security, and securing the same benefits of being in the single market the UK has currently. If agreed, the bill - presented by Labour MP Yvette Cooper - would require the PM by law to ask for an extension of Article 50. MPs took part in a three-hour debate on a business motion to set out how proceedings would run throughout evening. But a vote on an amendment to the motion, put forward by Labour's Hilary Benn, calling for time on Monday to hold more indicative votes, resulted in a draw - the first time such a result has happened in 39 years. The Speaker John Bercow then used his casting vote to reject the amendment, meaning MPs will not have the indicative votes next week. The overall business motion was passed, but by just one vote - with 312 MPs voting for it, and 311 against.